This class if full. The deadline has passed. Would you like to go in the space of four weeks from blank pages to a job application that’ll be ready to submit in the fall? Would you like to be prepared to get back in the job market armed with a strategy you can feel confident about by September? Are you finally feeling like you deserve to find a better opportunity where you can use your talents – and do you want to start taking the steps to finally land this opportunity before the end of the year? If you agree with any of these points then I’d love to help you get there this August 2016 through a unique weekly group program that’s all done virtually…and will require only 90 minutes of your time per week. Secure your spot – the deadline is August 3rd. Details below. Here’s the thing if you haven’t noticed by now: when work is in full swing, it is more difficult to make time during a busy week to focus on your next job move. A full-time job is not set up for extracurricular activity; as someone who likely puts out many unexpected fires during any given work week, you know how hard it is just to maintain your own baseline routine. As a result, I challenge you to make hay while the sun shines. This just might be the push that you need to make a meaningful professional change in your life. 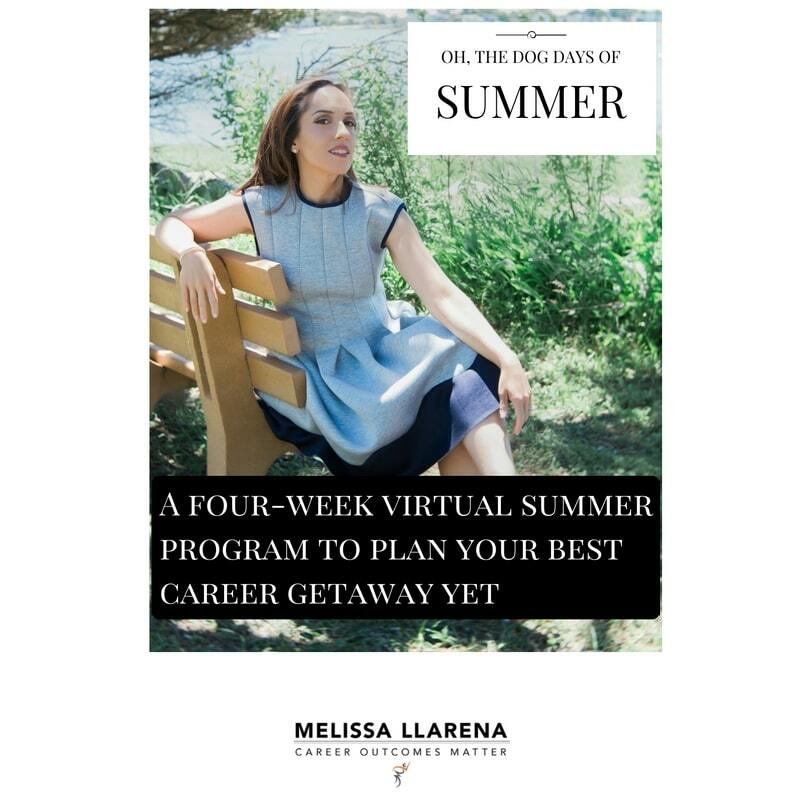 Introducing Plan Your Getaway This Summer, a weekly group program for job hunters who want to get a head start on applying job-search strategies that can be used during this season to make sure they are at the front of the line and ready to apply to multiple jobs in the fall. This time of the year tends to be slower for various reasons: your clients may have summer hours; some vendors are on holiday the entire month of August; and the nicer weather seemingly summons employees to work less and play more. Some job candidates use this time to relax and take time off since the rest of the world seems to be on vacation, and that’s fine for most. However, the most efficient job candidates use this downtime to step up their job-search prework so that when September comes around, they are first in line for the most desirable opportunities. My plan is to guide you this summer over the course of four weeks starting on Tuesday, August 9th, with a grand finale on Tuesday, September 6th. If you have 90 minutes a week, then you can find yourself on the crest of a wave in September after many employers have returned from holiday (or Labor Day in the U.S.)—or once they are ready to start reviewing job applications and schedule those interviews. You’ll have a template available that will provide you with the start needed to track the top 10 companies you want to prioritize based on fit, career prospects, and contacts. This will come in handy should you want to track your progress, as you’ll be able to adjust the template with new companies down the line. You’ll receive an email with your weekly materials on Tuesdays, including an audio set of instructions to help you prioritize your weekly efforts. You will complete your assignments on your time as homework anytime that week. We’ll come together on a recorded 45-minute group call on Thursdays at 12pm EST so that you can get feedback and brainstorming support to help you complete your efforts in time for the next week. Side note: you’ll be encouraged to submit your questions beforehand just in case this time does not work for you – in all cases I’ll make sure you gather the insights you need along the way no matter what time zone you happen to be in. Why should you join me to plan your getaway this summer? This four-week group experience is high octane. It is not for junior analysts. It is not for lowest-common-denominator business leaders—we need to be able to have rich business conversations throughout our time together. Procrastinators, on the other hand, I can work with. However, please know that I will be holding you accountable for your work and following up to ensure that you are moving forward. Ultimately, I want you each to get something out of this in our time together so that when September comes along, you are ready to PUSH THE SUBMIT BUTTON on your applications. If you’re ready to go in the space of four weeks from blank pages to a job application that’ll be ready to submit, are prepared to get back in the job market armed with a strategy you can feel confident about, or finally feel like you deserve to find a better opportunity where you can use your talents, then I’d love to help you get there. The deadline to secure your spot in this program is Wednesday, August 3rd, at midnight EST. The deadline has passed. Class is full. Your investment includes the complete Plan Your Getaway This Summer core curriculum, PLUS weekly audio instructions to help you get the work down to 90 minutes; high-value job-search resources aimed at accomplishing weekly objectives; and four weeks of live 45-minute group calls to address homework feedback—the things you need to get ahead of your competition who will be left in the sand come September. I want you to feel like this program is right for you before you join, so I’ll give you an answer to anything and everything you ask regarding this summer program. Simply email me melissa@melissallarena.com with your question. Secret: These executives have benefited from the same resources that I will share with you this summer. Hear what they say about what it’s like to work with me. Terms and conditions: The founder of Career Outcomes Matter LLC, Melissa Llarena stands by the services and products sold on this site. All sales are considered final and non-refundable. The goal is that you will be delighted. Melissa will be leading this group experience herself and will make sure that your expectations are exceeded during these four-weeks.